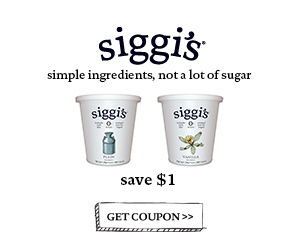 My favorite yogurt, Siggi’s, has a $1 off coupon you can print HERE. Find Siggi’s locally at ShopRite, Whole Foods and some Target stores. This entry was posted in Coupon and tagged coupon, siggis. Bookmark the permalink. ← Free Cone Day at Ben and Jerry’s TODAY!